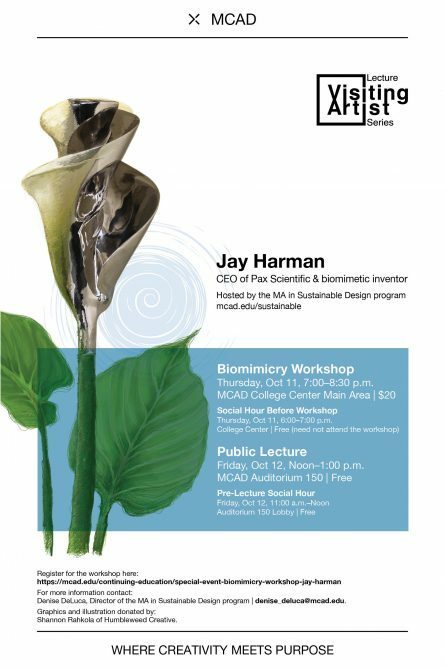 The Master of Arts in Sustainable Design (MASD) program and the Minneapolis College of Art and Design (MCAD) is thrilled to host inventor, entrepreneur, and biomimicry pioneer Jay Harman as our Visiting Artist October 11-12, 2018. Denise DeLuca, Director of the MASD program and Biomimicry Education Fellow, will be Jay’s host and will facilitate the Biomimicry workshop. Come to one or more of our events to meet and learn from Jay, and to learn about and meet the crew from the MA in Sustainable Design program. As the world increasingly seeks environmentally-friendly solutions to more complex problems, Jay Harman’s biomimetic message gains more and more attention. Described as a “visionary” and “futurist” by the Science Channel, Jay’s expertise couldn’t be more timely. An award-winning entrepreneur and biomimetic inventor, Jay Harman has taken a hands-on approach to his lifelong fascination with the deep patterns found in nature. In the process, he has founded and grown multi-million-dollar research and manufacturing companies that develop, patent, and license innovative products, ranging from prize-winning watercraft to interlocking building bricks, afterburners for aircraft engines, and non-invasive technology for measuring blood glucose and other electrolytes. He is credited with being among the first pioneering scientists to make biomimicry—the science of employing nature in advancing sustainable technology—a cornerstone of modern and future engineering. His latest ventures—PAX Scientific, PAX Water Technologies, PAX Mixer, and PAX Streamline—design more efficient industrial equipment including refrigeration, turbines, fans, mixers, and pumps based on Jay’s revolutionary concepts. To say he can’t sit for very long in one place is putting it mildly. Aside from his entrepreneurial exploits, Jay started a boarding school to teach kids about the environment in Australia, became a champion skin diver, sailed his own yacht 27,000 miles on the Indian Ocean, restored the sister ship to Jacques Cousteau’s Calypso—and made it his mission to bring the subject of biomimicry to the public. Born and raised in Australia, Jay started his career as a naturalist with the Department of Fisheries and Wildlife, but quickly demonstrated talents as an inventor. In 1982, he founded ERG, Ltd, which grew into one of Australia’s largest technology firms with a capital value as high as $3 billion. Since then, Jay has been at the helm of numerous companies recognized as global leaders in their respective fields. The culmination of Jay’s work is the development of “Nature’s Streamlining Principle,” a guideline for translating nature’s extraordinary efficiencies into industrial applications. Jay’s goal—both as an author and an entrepreneur—is to show industry that improving the efficiency of industrial equipment is beneficial for both the bottom line, and the planet. Learn more about his book, The Shark’s Paintbrush. Be inspired by this short video and this longer video. Interested in learning more about biomimicry in the MA in Sustainable Design program? Email Denise DeLuca ([email protected]) or come join our next informational webinar!